Wow! How on earth do you write that session up? I’ve just sat through a panel discussion around where the procurement function is headed in the lead up to 2030. This might sound extreme but it was the best procurement panel discussion I’ve ever heard. From redefining business models, removing ourselves from the grasps of the finance function, being the central conduit to delivering social value through to disappearing all together. If I was to sum procurement’s future up in a word it would be immense. The panel consisted of Tim Hughes from Oracle, Olinga Ta’eed, an entrepreneur, investor and social activist, Giles Breault from The Beyond Group, Jason Busch of SpendMatters, Nic Walden from The Hackett Group, Lance Younger from Statess and Rio Tinto’s CFO Chris Lynch, so it was an all-star cast to say the least. Full video of the discussion will be online over the coming days, so I’ll keep my commentary short, but here is a brief rundown on the insights the panellists had to offer. Giles Breault: Suggested that while there are still significant gains to be made within our businesses, the true value procurement can provide the organisation is in opening up supply relationships and enabling our businesses to leverage external innovation. Tim Hughes: Highlighted the challenges the function faces in attracting new talent. According to Tim, the profession is aging and more people are retiring from the function than are entering it. How do we attract the right people to procurement and how do we motivate them once they are in were questions he posed? Lance Younger: Echoed Giles’s sentiments by saying that procurement will be responsible for fundamentally changing the way businesses operate. 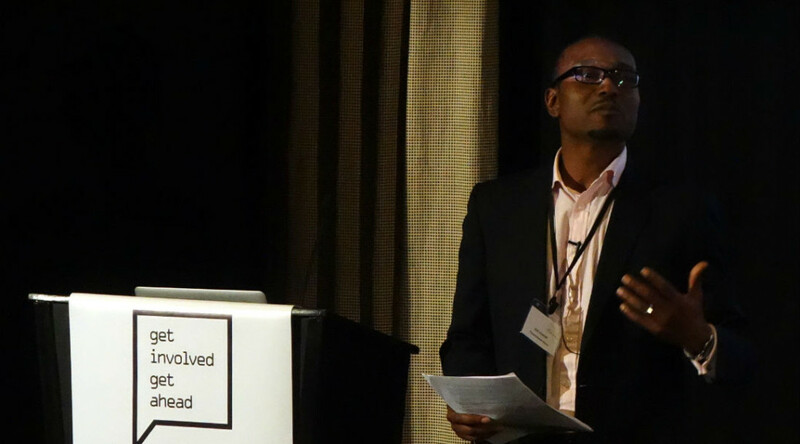 According Lance, procurement can alter business models by connecting organisations and enabling suppliers and buyers to work together on mutually beneficial, collaborative projects. The old buyer vs. supplier mentality will be gone. Nick Walden: Suggested that procurement will struggle to provide value beyond cost so long as it is answerable to the finance function. Finance’s mentality is dollar driven and procurement can offer so much more than that. The theme of social benefit was positioned throughout the discussion and procurement was seen as as the gatekeeper and catalyst to these sorts initiatives. Jason Busch: As well as providing a fantastic analogy likening procurement’s progress to the evolution of the Porsche sports car’s transmission, Jason suggested that we are on the verge of a golden age of procurement for the SME market. He pointed out that out traditional procurement technology has been almost exclusively developed and targeted at large organisations. The evolution of new technologies like Amazon for Business provides instant benchmarking for small and medium sized organisations. It essentially an e-procurement solution for SME’s he argued. 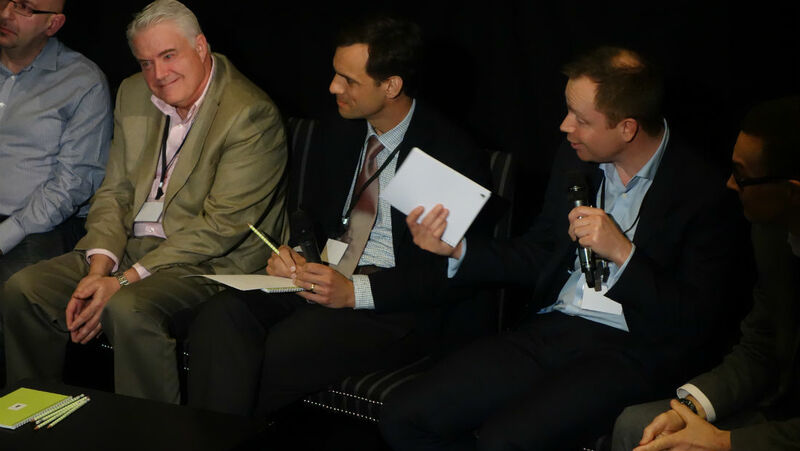 Chris Lynch: Following on from his brilliant keynote speech, Chris took the opportunity of the panel discussion to forward the idea that, in the future we should strive towards an organisational framework where procurement (and other functions) goes largely unnoticed. He suggested that value should be seen as value regardless of where it originated. We need to think about business value, not procurement value or finance value he said. Chris also highlighted that social media platforms are the ideal medium for these ideas to be shared and developed. Olinga Ta’eed: According to Olinga, every government in the world is looking to procurement to change its society. He believes that the way we buy things has the power to change people’s lives and that procurement is central to delivering this social value and change. He referenced new social value acts in the UK and legislated CSR contributions in India and Indonesia that are changing lives in those countries. Olinga also suggested that in 2030 our accounting standards will be altered to report social impact as well as mere dollar values. 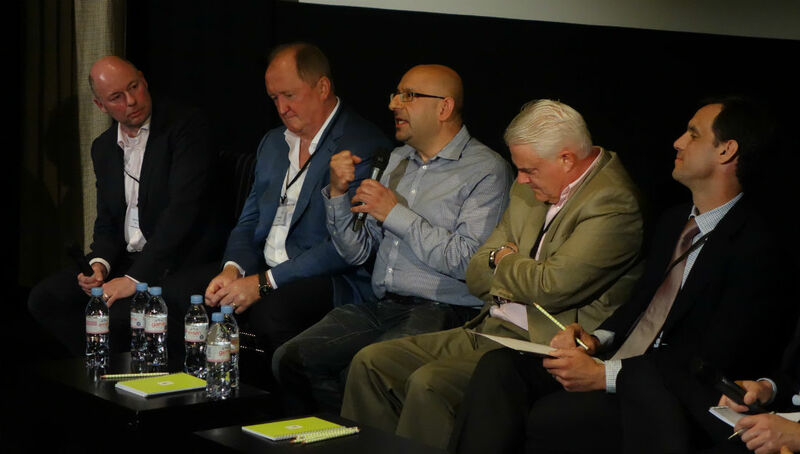 Well, there you have a very brief rundown of a fascinating panel discussion. Be sure to check in on Procurious to see the full recording of this session. I guarantee you wont regret it. What can Procurement learn from UBER? I’ve just been listening to Chris Sawchuk from The Hackett Group give a keynote speech about the need for agility and flexibility within procurement operations. Chris stressed that in a business environment where markets are constantly changing (oil prices, exchange rates etc.) the need for organisations to adapt and move quickly has never been more important. But what does all this mean for procurement? According to Chris it means being more customer centric and it means delivering value beyond cost savings. Chris detailed that procurement’s moment in the sun as a cost cutter is coming to end. Particularly now that economies are starting to emerge from the crisis, revenue generation is again taking centre stage and procurement needs to offer more than simple cost cutting initiatives. Chris said that organisations need to start focusing on driving innovation and that the key to doing so lies in leveraging a more customer centric approach. He positions UBER as a great model of customer centricity, UBER puts control back into the customer’s hand – it’s easy to use, you know exactly what it will cost, how long it will be and there are no hold ups. But again we have to ask, what does this mean for procurement? The biggest criticism the procurement function has received over the years is not that we are too cost focussed or process driven, it’s that we are too slow and cumbersome. How can we ever expect to serve our customers (internal or external) when we are perceived as slow and cumbersome? Speed and usability are critical and, traditionally, this has not been an area that procurement has succeeded in. Chris suggested that in order to better serve our customer’s procurement needs, we need to take a more advanced approach to how we classify them. We’ve all seen the classic Kraljic Matrix (strategic, bottleneck, etc. ), but this simplification of our customers doesn’t stand up any more. We need to start looking at our customers in a more strategic manner and go to greater lengths to understand what motivates and drives them. The importance of developing a procurement brand was also discussed in the session. Essentially, Chris highlighted that procurement needs to be more active in the way it promotes itself. We need to ask ourselves how we want to be perceived and then start taking steps towards making that perception reality. How can we make progress through the jungle of procurement? In the first of our ‘Big Ideas’ panel discussions Sigi Osagie, Helen MacKenzie, Andrew MacAskill and Sarah Trota took to the stage to provide their perspectives on authentic leadership, and the challenges of trekking through the procurement jungle. The panel are asked: What is the role of the leader in reengaging the humanity? Helen starts things off by offering a personal story taken from her experience of working as Head of Exchequer Services in local (Scottish) government. We’ve been on a significant journey of change in the way we do procurement. To have a vision of where you’re going, and to get the passion into the vision. Helen likens it to adventuring through a jungle, machete in hand, clearing the way for the team in tow. There are always blockers in business, so you must find a way for your team to make things happen. It’s also important to act as the cheerleader – she gives the great example of winning awards, and the rallying effect this has on the team. Recognition shining through. Andrew says that it’s always about setting the belief. When you meet C-Suite people from other organisations they are more excited about the potential. Sarah reckons it’s more of a brand challenge. How is this achieved? By working collaboratively and changing perceptions (for instance, HR is notorious for having a bad image). Jules: There’s a belief in the IT industry that they are under-valued. So why is it so hard to get collaboration across the board? According to Sigi, the one industry that never has this victimhood mindset is Finance. Dollars is the value of business – even if you’re in the charity or public sector we still measure in dollars. This opinion proves controversial: should Finance be the poster-child, and is it not the one business function that’s first to fail? (Indeed it is usually the first function to be held accountable). Sigi says procurement has always faced an uphill struggle. There’s legacy challenges. However it has come a long way – but progress tends to be seen first in large businesses. In a parting statement Sigi ends on a philosophical note, claiming we’re not here to do procurement, we’re here to do business. If there’s a man more enthusiastic and passionate about procurement improvement that Sigi Osagie I’d like to meet him. 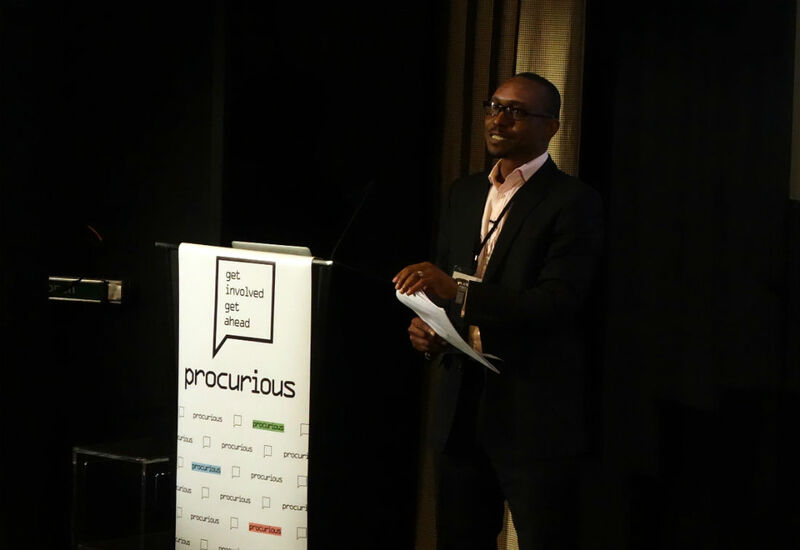 I’ve just listened to Sigi outline his thoughts around the importance of people in the procurement process at the Procurious Big Ideas Summit. His insights were inspiring to say the least. Sigi spoke passionately about how while processes and technology are critical enablers for procurement success, ultimately it’s people that make the real difference. The analogy he gives is a great one. If you or I were to walk into a Gordon Ramsey’s fine dining restaurant and were given full access to every kitchen utensil in the building (read: procurement technology and tools) and even provided with a recipe written by Gordon himself (read: procurement processes), the food we would produce would likely be mediocre at best. That’s because its people that ultimately make the difference. It’s the chefs skills and motivations, but perhaps more importantly their passion that makes the food they produce remarkable. After highlighting his own remarkable journey from an immigrant arriving at Heathrow airport, to a floor sweeper at the Leicester Square Haagen Dazs, to a global director in a FTSE250 blue-chip multinational in 14 years, Sigi stressed the importance of procurement bosses leaving their egos at the door and encouraging their staff to ‘be the best version of themselves’ at work. “Procurement success is all about unlocking your people” he said. Sigi left by challenging the audience to actively take responsibility for their own growth and careers and to ask themselves if they “were being the best you you can be”. Definitely some great food for thought. To join the discussion, post right here on Procurious, tweet Procurious @procurious_ or me @jordanearly123. Remember to include the hash tag #BigIdeas2015. The Big Ideas Summit 2015 Is Live! Welcome to the Big Ideas Summit 2015! The Procurious Big Ideas Summit is off to a flying start. The venue is stunning, guests are fed and caffeinated and, as I type this Tania Seary, the founder of Procurious is giving her opening speech. As Tania has just pointed out, while there are only 40 people physically in the room today, the unique nature of this event means that you, the 5000 Procurious members, can contribute to the day’s proceedings digitally. The event has an incredible line-up of speakers. I’ve already had the good fortune of speaking with the indelible Sigi Osagie and Mark Perera who are both excited to be a part of the day. The agenda is packed with industry thought leaders, representing the full spectrum of the procurement profession. If you’ve got any questions for us or any of the influencers here today, get in touch and I’ll do my very best to get you an answer. Here’s to a great day!! Andrew MacAskill was once Managing Director at The Source, a sister company to Procurious and The Faculty. Andrew built the organisation from scratch into a leading procurement and supply chain industry search practice. A move to London saw him take the helm at Executives Online, the aim? To Transform Executive Recruitment. 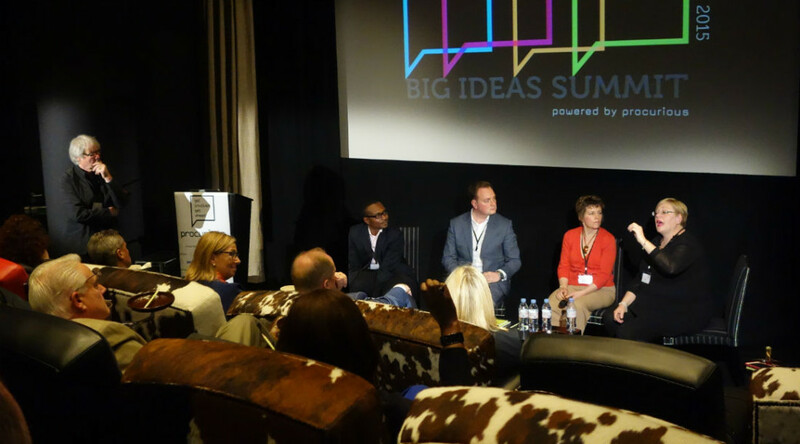 Andrew will be attending the Big Ideas Summit on 30 April, to hear his Big Ideas on attracting and retaining talent join the Group! 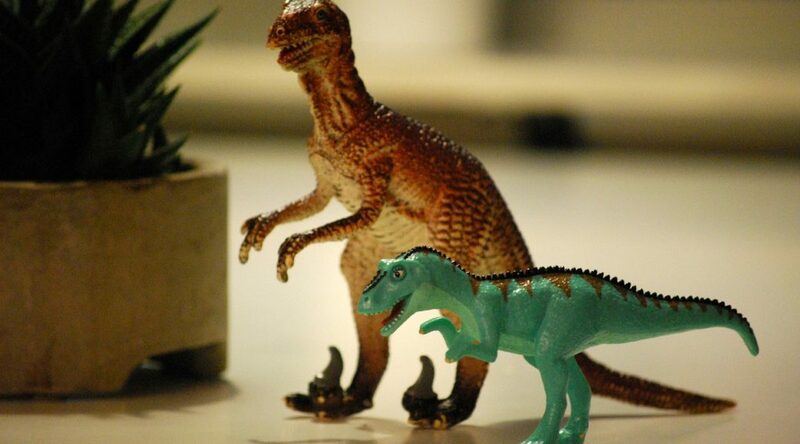 Procurious asks: We particularly liked your post [on Procurious] about dinosaurs in the boardroom – could you talk about what needs to be done, the profession’s inability to change etc? Andrew: Firstly, business leaders need to confront the brutal facts and have acceptance that the world of work has changed for good. This can be hard when your previous successes were built on previously considered solid and proven foundations that no longer exist. However, to avoid the fate of the dinosaurs it is entirely necessary for the progression of yourself, your team and your organisation that you are agile and adapting to change constantly. Procurious: At Executives Online (your Executive Recruitment & Interim Management Company) you are using science, craft and technology to de-risk critical hires, and to attract top talent. Those are some suitably Big Ideas! Can you tell us more? 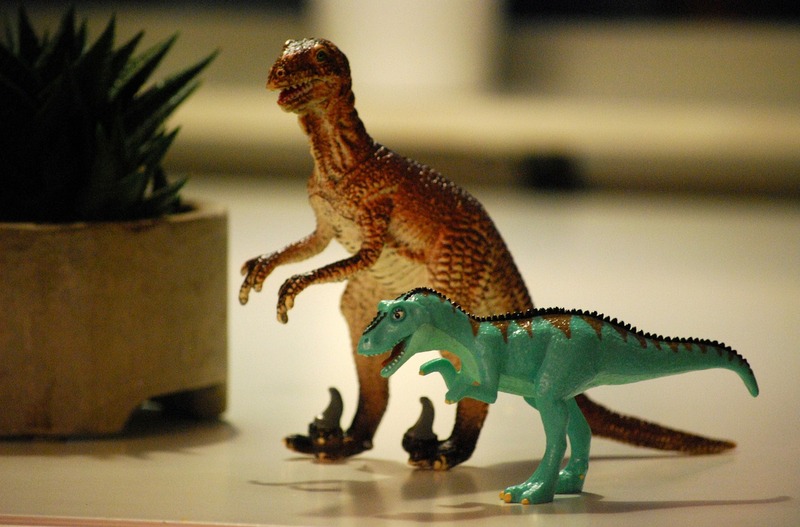 Andrew: Executive Search is a classic example of an industry that is rife with dinosaurs! In essence at EO we believe that the traditional search model is broken and have spent the last 18 months disrupting the industry with a fresh approach that de-risks our clients critical leadership hires through the use of our executive-intro™ platform. The platform is accessible via an app that allows you to review a shortlist confidentially from anywhere in the world and provides candidate insight through the use of video’s, role specific behavioural testing, benchmarking and competency testing. Procurious: How does social media and networking play a role in today’s hiring procedures/and then retaining said talent? Andrew: Social media now plays a vital part on both sides of the hiring equation. When we are headhunting top leadership talent for our clients the first thing that the potential candidate does (often whilst we are still on the phone call) is to start researching the hiring client and leadership team online. This means that everyone should invest in social media all of the time to build strong personal and company brands – it is far more than just a job hunting channel for candidates and can help you establish your group as an employer of choice that holds on to their superstars. Procurious: How is people management and culture changing? We’re hearing more and more about changing attitudes to flexible working, charity work, other incentives etc. Andrew: People management is becoming more transparent, less autocratic and more authentic. The changing world requires a collegiate bond and trust across the workforce to gather together and succeed in the challenges and opportunities ahead. Culture is becoming an ever more important factor in how candidates select employers – generation Y in particular also favour those organisastions who they view as good “corporate citizens”. Procurious: What value can truly strategic procurement bring to organisations? Andrew: A huge amount – procurement leaders are uniquely placed to take a view and add value across the full value chain. Having a CPO at the table during risk management strategy discussions, mergers and acquisition events and strategic alliance engagements is vital to commercial success. Andrew: Inspired by the likes of Basecamp and WhatsApp the tech start-ups in London across areas such as Old Street and Shoreditch are throwing out the traditional people management rule book and work completely against outcomes. They are flat in structure, have no dresscode, no fixed hours, no fixed holiday allowance and minimal internal meetings. The approach is obviously working as tech start-ups in London are receiving more funding than ever and attracting top talent from the larger players. 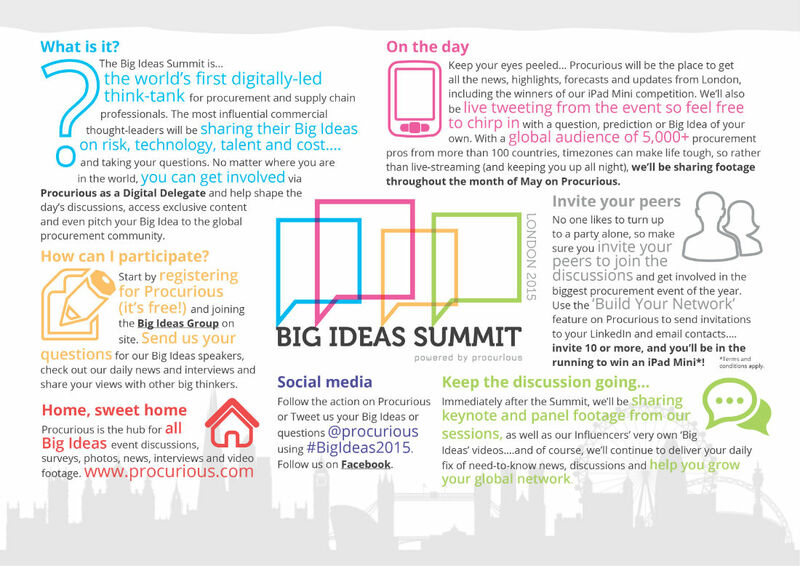 Procurious: Why should other professionals make time in their diaries to participate in the Big Ideas Summit? Andrew: The Big Ideas Summit is an industry first that will benefit all involved. Dedicating time to explore ideas with peers and dream a little is healthy and allows you time to reflect on the industry, your career and the future. I have known the team behind the Big Ideas Summit for many years and can recommend the investment of time for any serious procurement professional with absolute confidence. Procurious: And finally, gaze into the crystal ball. What’s your Big Idea for 2030? What can be achieved, what has the potential to be a true game-changer? Andrew: My big idea for 2030 is to turn the talent acquisition industry on its head through focussing primarily on behaviours over technical skills. Hear from 40 of the world’s biggest influencers and thought-leaders. 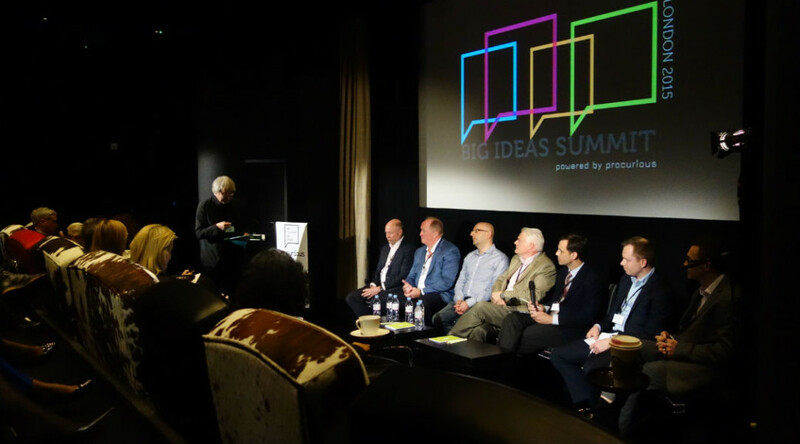 Join the Big Ideas Group to access exclusive content from the event. 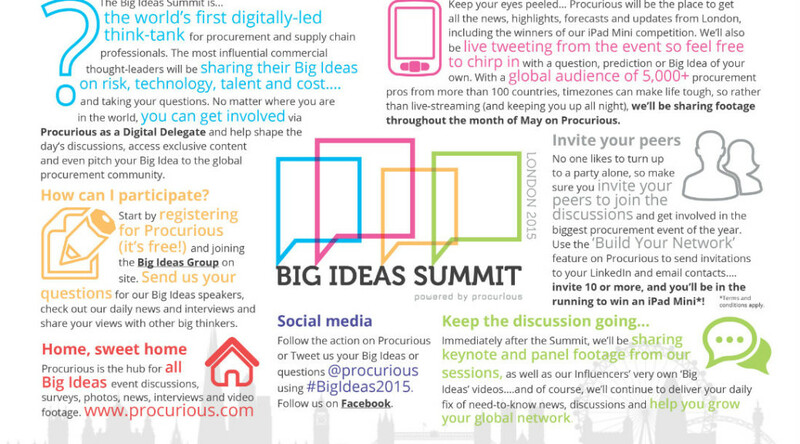 The Big Ideas Summit is the world’s first digitally-led think-tank for procurement and supply chain professionals. It is powered by Procurious. 30 April 2015. Expect to see most of the action between 09.30 – 17.00 (GMT) However the thought-provoking discussions and lively debate will continue long after, and we’ll also share video footage throughout the month of May on Procurious. 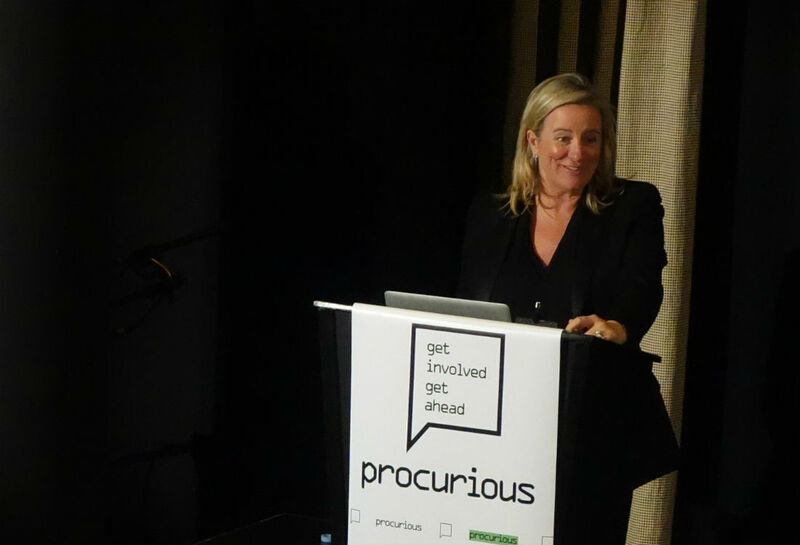 Although the event itself will be held in at a central location in London, due to its digital nature Procurious members will still be able to get involved. You’ll need to be a registered member of Procurious – join here for free if you haven’t already. 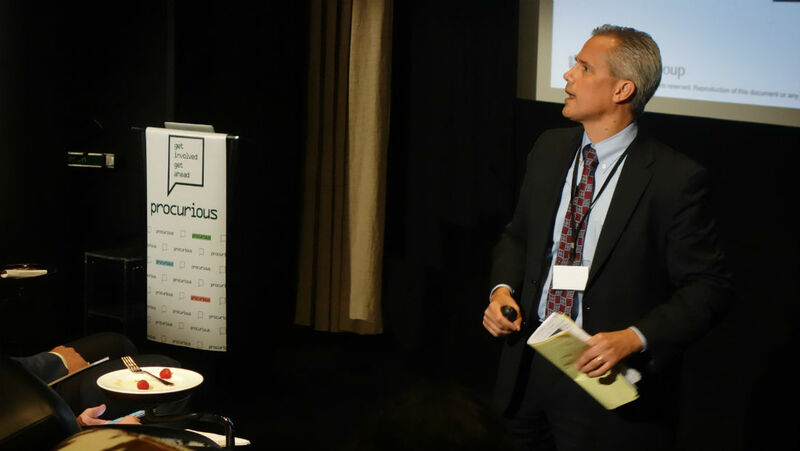 Then simply access the Big Ideas Summit Group page (which can be found here) to soak-up thoughtful opinions, participate in insightful discussion, and share your own Big Ideas with the Procurious community. We’ll also be live tweeting throughout the day, so make sure you’re following @procurious_ to share and respond to our tweets. 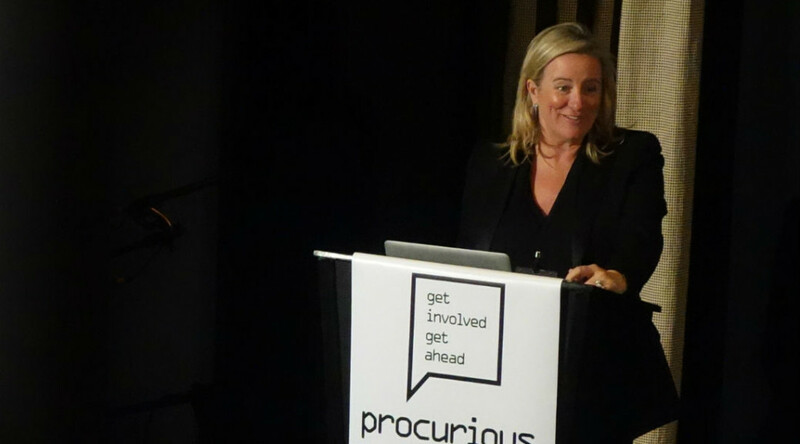 Procurious boasts a global audience of 5000+ procurement professionals from more than 100 countries. If we were to cater to all of these timezones, it would be a tough job – so rather than live-streaming (and making you keep awkward hours) we’ll instead share video with those who’ve registered. We’ve listed 6 of the most-compelling reasons here. 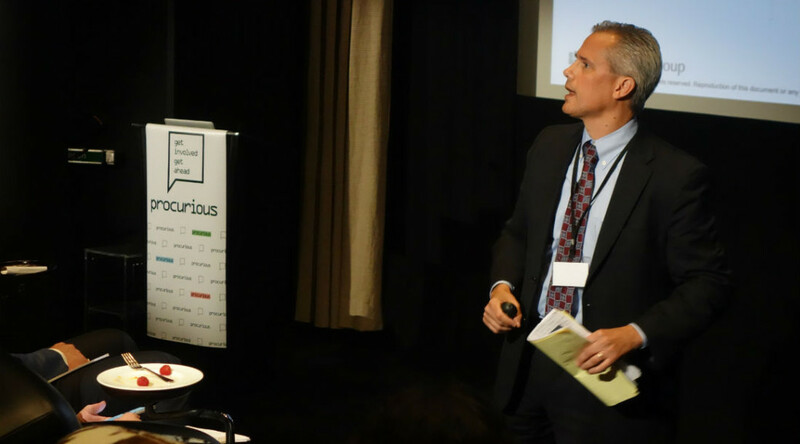 The term ‘influencers’ refers to the specially-invited thought-leaders who will be sharing their Big Ideas with the room and you – the Procurious community. 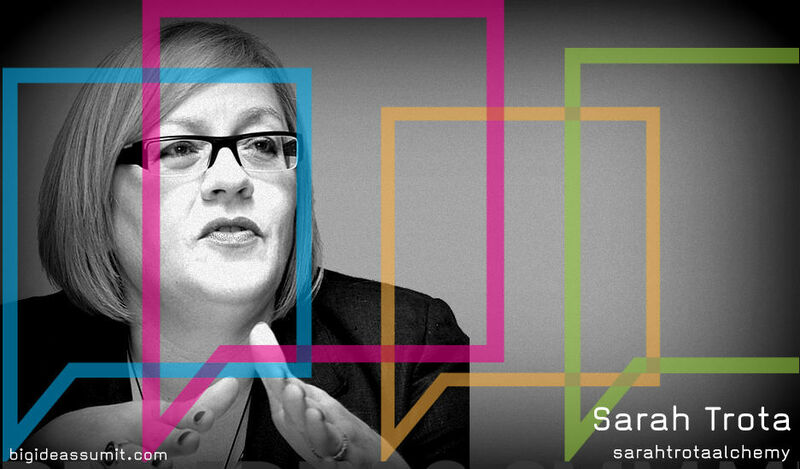 Our experts span the worlds of procurement, technology and social media. There will be CPOs from organisations including: Burberry, NHS, AstraZeneca, Hovis Ltd, and Exchequer Services, media from Spend Matters and Redactive, and experts representing the bleeding-edge of tech. As well as CIPS, McKinsey & Co, The Hackett Group, Jules Goddard from London Business School, and Rio Tinto’s CFO, Chris Lynch. The full list is available to view at bigideassummit.com. Great to hear! 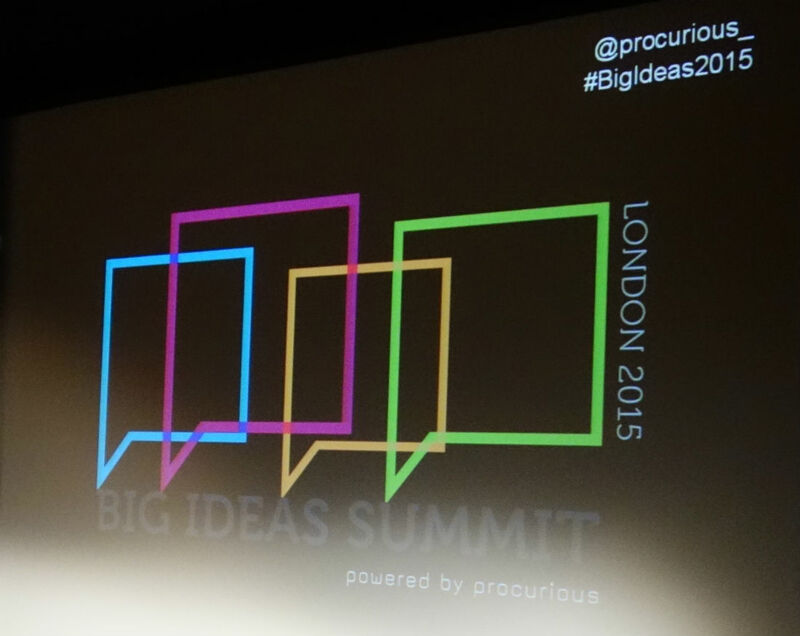 You can Tweet us your Big Ideas @procurious_ remembering to use the hashtag #BigIdeas2015. Is ethical fast fashion an oxymoron? `Our People Are Our Greatest Asset.` Erm… Really?! What are the innovations transforming supply chains & biggest trends right now?